I was so amazed by this dessert – it’s unlike anything I’ve ever eaten! The base is a meringue that’s crisp on the outside and marshmallowy on the inside. To use the leftover egg yolks, you make a lemon curd to spread on top. Add in whipping cream and your berries of choice, and it’s all absolutely divine. The Pavlova originated in Australia, and was named after the Russian ballerina Anna Pavlova. The outside of the meringue shell is supposed to resemble a tutu. It is traditionally filled with plain whipped cream and fruit (sometimes kiwi and passionfruit! ), but I love this lemon curd version Gourmet concocted. I think you could use any fruit and filling that was in season – in Jamie Oliver’s latest cookbook, Jamie at Home, he makes a similar dessert topped with canned pears and chocolate sauce. Make this for a crowd because leftovers get soggy. I served it on top of a cutting board and sliced it into pie-shaped wedges at the table. And don’t forget (like I almost did) to pass around a big bowl of unsweetened whipped cream to top each piece off – it tempers the sweetness of the meringue and adds a luxurious over-the-top richness. Preheat oven to 300 degrees F. As a guideline, measure and draw out a 7-inch circle on a sheet of parchment paper (I ended up spreading my meringue out to about 8 or 9-inches, but I could have made it a bit taller). Then flip the paper over and place it on the baking sheet. Whisk together superfine sugar and cornstarch. Then, get out your electric mixer and beat the egg whites and a pinch of salt on medium speed, until they hold soft peaks. Add the water. The whites will loosen, but don’t worry – just beat until they hold soft peaks again. Crank up the speed to medium-high and beat in sugar mixture 1 tablespoon at a time. Then, after all sugar has been added, beat 1 minute more. (This is a weird addition, but it’s what creates the marshmallow-effect) Add vinegar to the egg whites and beat at high speed until meringue is glossy and holds stiff peaks, about 5 minutes (The directions say it could take longer with a hand mixture, but it didn’t take me long at all. . . I think it’s because my egg whites were warmer). Spoon the meringue out onto the parchment, and gently spread inside (or slightly outside) the circle you drew on the parchment. Make the outside edge of the meringue slightly higher than the center, so there’s a crater to hold the curd and fruit. Bake for about 45 minutes, until meringue is pale golden and has a crust. The inside will still be gooey. Then, turn the oven off and prop door open a little with a wooden spoon – let it cool in oven for 1 hour. Lightly beat yolks in a small bowl to get them ready. In a saucepan, stir together sugar, cornstarch, salt, lemon juice and butter. Bring to a simmer over medium-high heat, whisking, then continue to simmer, whisking constantly, 1 minute. (I turned off the heat at this point so I could concentrate on not curdling the eggs.) Carefully whisk 1/4 cup lemon mixture into the egg yolks. . . Then whisk in a little bit more, and finally, whisk the yolk mixture into the rest of the lemon mixture in the saucepan. Over low heat, cook a little longer, whisking constantly, until curd is thickened (about 2 minutes – do not let boil). Pour it into a small bowl, stir in zest, and chill, surface covered with parchment, until cool (about 1 1/2 hours). If you’re going to be short on time and/or stove space, this curd can be made up to 2 days in advance. Beat the cream until it just holds stiff peaks, then fold about 1/4 cup whipped cream into curd to lighten it up. (I almost forgot this step!) 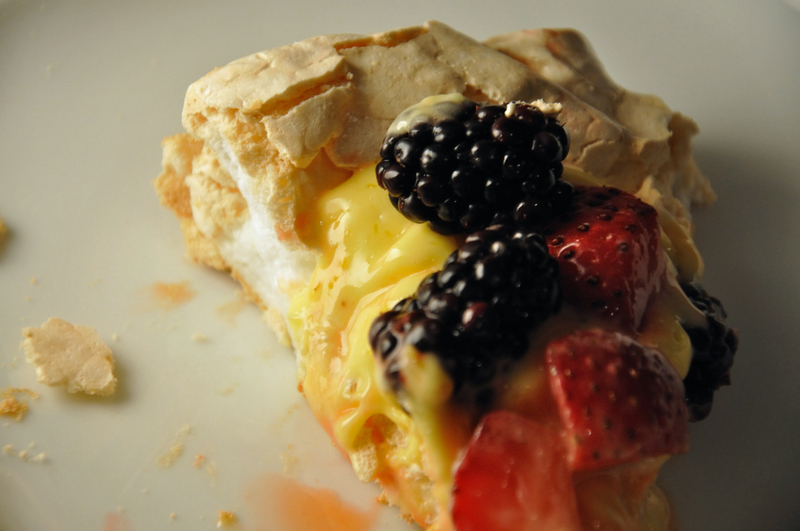 Spoon the lemon curd into the meringue shell and spread it around, then mound berries on top. Pass the rest of the whipped cream around the table, so everyone can help themselves. That’s a gorgeous picture. I’ve not made meringues before but I may have to try!! It was good but way too much work for what it ended up being. It’s nothing more than an upside down lemon meringue pie with fruit on it. The meringue recipe is delicious though and I would make that again! !